In October 1993 Pamela Lim opened The Garden Party shop in Ponsonby, Auckland, where she hand-decorated plates and fired them in a kiln in the storeroom out the back. The colourful majolica designs were very popular and so a factory was set up next door, where we made tableware with a plate making machine, purchased from Morris and James in Matakana. We had 4 big kilns running hot, and many staff designing and decorating plates, bowls, cups, jugs, platters and tiles. The Kiwiana inspired dinner sets were hugely popular. 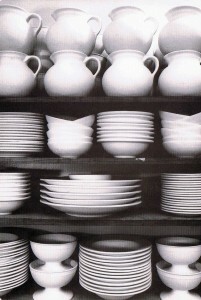 Over time fashions have changed and so have ceramics. We moved into sushi plates and then developed a range of brilliant crackle glazes to go with them. We exported ceramics to the UK, Hong Kong and Australia. As cheap ceramics imported from Asia began to dominate the tableware industry, we turned back to the clay and started hand making tiles and wall art using slabrolling machines. Bex Plowman led the design through this period. In 2007 the Milk Bottles were reborn in ceramic and so began a move towards slipcast shapes with an historical kiwiana element. In 2009 the Factory was moved to Waiheke Island, and more functional wares began to re emerge in soft deco greens and blues. Kirsten Anderson joined the team and inspired new directions in slipcasting bowls, plates and tumblers. Peter Baigent bought out the partnership in 2011 and the following year a new brand was developed and Factory Ceramics was born. We continue the exciting development of new products with inspiration from Scandinavian modernism and historical NZ design. We also sell seconds and end-of-lines direct to the public through our Factory Shop.